"So last night I was watching a food network show on the best food trucks around the country. 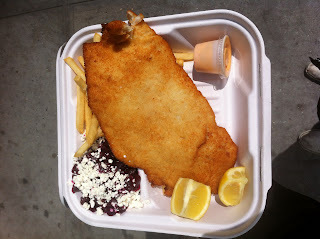 I saw a truck in New York, Schnitzel and Things, and was extremely intrigued. They serve various schnitzels, along with sides, and it's apparently very good; they have even opened up a small restaurant around 45th St. in addition to the truck. I checked out the truck's schedule and found that it was going to be at 27th and Park today so I had to try it. I got the Chicken Schnitzel platter with beet and feta salad and fries, with a spicy sriracha mayo sauce. Very good, albeit unhealthy. Might be a good thing to try next time you are in New York!" It used to be that "a dirty water dog" from the local food cart was a fast and cheap lunch. Today gourmet food trucks seem to be destinations in their own right - especially in New York City. What's next? Caviar and blini on the corner? Paté de campagne and cornichons on Columbus? I checked out the menu for Schnitzel and Things and it looks amazing and real competition for the original. Check out my blog entry on the schnitzel in the birthplace of schnitzel - Austria. Simply stylish and modern – as you would expect from this Michelin One Star fine dining restaurant at the Metropolitan Museum of Art. Glass, white, and shades of grey are punctuated with purple floral arrangements. This very “modern” dining room overlooks the outdoor Abby Rockefeller Sculpture Garden back dropped by a 4 -5 story New York skyline. This is a true visual oasis in the heart of the city. 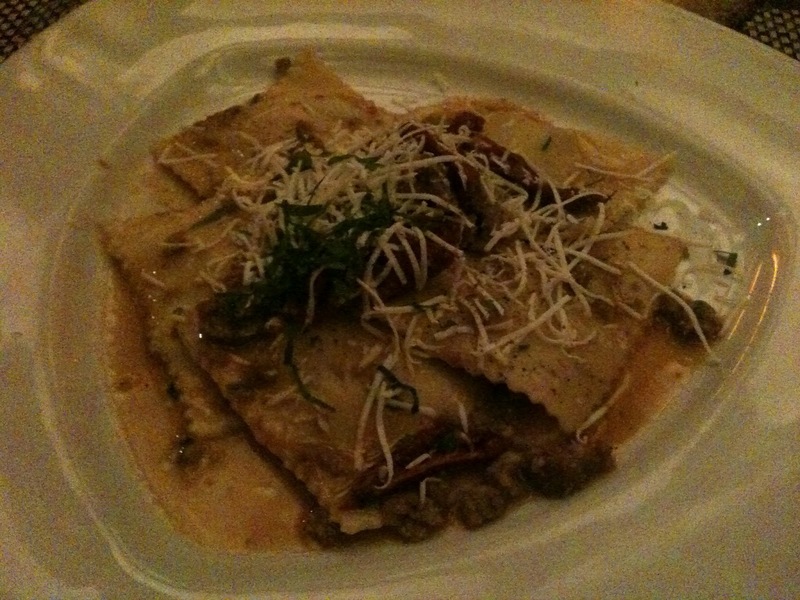 There is a prix fixe menu with numerous choices for each of the four courses. Everything is artfully presented and visually appealing. Service is plentiful but unobtrusive. Of course there are plenty of amuse bouches and at the end of the dinner a lovely chocolate cart with a plethora of homemade chocolates. The wine list is excellent – we try a 2009 Talley Olive Chardonnay and a 2008 Merry Edwards Pinot Noir from Russian River, Ca. As for the food: some of the dishes are excellent and amongst the five of us we try almost everything on the menu. And again, the presentation is artful. But many of the dishes are just ok from a taste standpoint. For example, I keep thinking I would much prefer a simple grilled lobster tail with a lemon butter dipping sauce as I try to savor my Slow-Roasted Maine Lobster Tail with Caramelized Turnips and Ginger-Tamarind Jus. And I am dreaming of simple raw oysters in the shell with a touch of shallot mignonette sauce as I labor through my Kumamoto Oysters “En Pannequet” - oysters wrapped in some sort of green leaf and smothered in some sort of red sauce. Ok, all is not lost – the Jerusalem Artichoke Soup with Black Winter Truffle and Rye Bread Crouton is excellent. Can't I Get to a Real Show?? Must see, must see. Poignant and fascinating. The site is still undergoing renovation and the new visitor’s center is still under construction but that’s ok. Go now and again later when all is complete. Free entrance but you must reserve tickets ahead of time. Layers of symbolism and poignant reminders of that fateful day, the people who died and the collapse of the awe inspiring Twin Towers. The controversies surrounding the site and the memorial seem to have calmed down a bit. I find the young Israeli architect Michael Arad’s design entitled “Reflecting Absence” solicits much discussion and interpretation. The two pools that comprise the memorial sit on the footprints of the twin towers, both with waterfalls cascading into a black void. We visit the memorial on Easter Sunday, an appropriate time and place for reflection on this special morning. I am told you must also visit at night for an entirely different and perhaps even more inspiring experience because of the lights. Whenever you go, make sure to talk to and listen to the park rangers as they answer questions. They are a wealth of knowledge. The rooms are furnished in shades of wood, white and grey. I am not sure why it all fits together as it seems effortless. But suffice it to say that our room is very soothing – I feel so comfortable and comforted staying here. We have a junior king suite which is one large room with a sitting area with very large and lovely bathroom and closets. Our view is not ideal by any means but we do have a very appealing “4th night free” rate so I can’t complain. Service is impeccable. And the doormen will be happy to radio the driver of the Maserati to take you anywhere in the city. Yes, this is quite a marketing technique. The hotel owns a Maserati (comes with a driver) that can be used by any guest (first come first served, free of charge). We were able to use it twice. To be honest this perk is a bit lost on me – the car seems like a normal small sedan. But for people who know their cars at all this would be a nice perk for staying here. Our first morning we walk just around the corner to the Morgan Library and Museum. I have never developed a great appreciation for museums; however, I do enjoy art collections located in former mansions or homes. J. P. Morgan, a leading banker in the 1800’s, was also a serious collector of books and art. He wanted to rival the holdings of renowned European libraries. Over the last century, the Morgan has expanded to incorporate three historical buildings with three new modern glass pavilions to house the growing collection. A highlight is J. P. Morgan’s original library that he had designed to house his collection of rare books and manuscripts. I think we’ll get our museum activity out of the way today so we can move on tomorrow to more exciting things… So after a lovely lunch with friends on the Upper East Side we walk from there to a museum I actually really want to check out. The Museum of the City of New York at 103rd Street and Fifth Avenue has an exhibit entitled: “The Greatest Grid: The Master Plan of Manhattan, 1811-2011”. I love looking at the history of a city through pictures and maps. However, I am a bit disappointed in this exhibit - I was hoping it would have more in the way of photography or pictures showing the different time periods of the city. I enjoyed much more another exhibit we happened onto: “Cecil Beaton: The New York Years”. Amazing photographs by this British photographer and socialite of celebrities in the early 1920’s – check some out here. This evening we traverse New York again and meet up with good friends for dinner in their neighborhood on the Upper West Side. Spiga is a charming, intimate, warm, neighborhood gem which makes it also perfect as a destination restaurant. The warm artichoke and pistachio salad is a must have. My homemade pasta with sausage and an artichoke pesto sauce is excellent. This is a small restaurant so reservations are essential. This morning helicopters are continuing to fly everywhere – quite a busy city today. It is gorgeous out and the cherry blossoms are not quite ready but the earlier budding magnolias provide a nice backdrop. 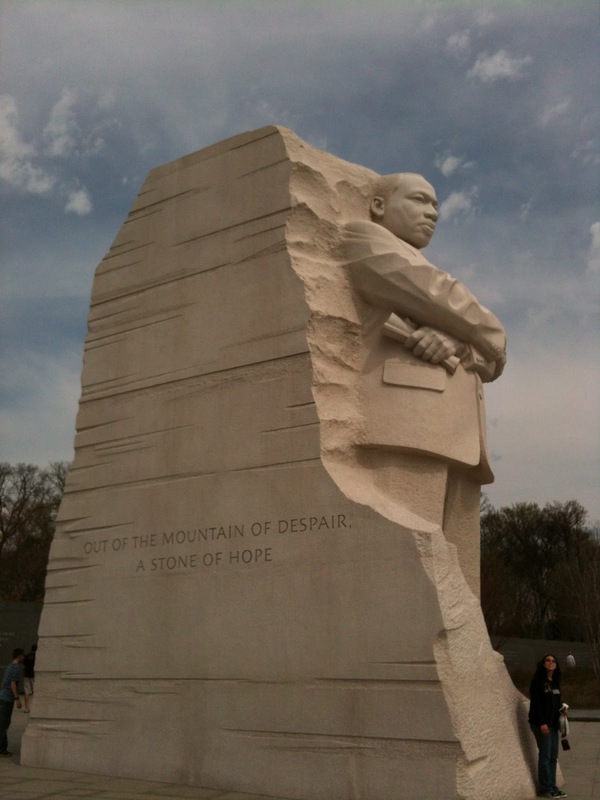 I walk down the Mall to the Martin Luther King Jr. Memorial – it is perfectly positioned on the Tidal Pool across from the Jefferson Memorial (my personal favorite). This is my first time at the new MLK memorial, completed in the fall of 2011. I love how each of the different DC memorials exhibit a different tone and theme and style. The reviews of the new MLK memorial suggest that the large King statue carved into stone is almost Stalin looking. I have to agree. biking - the best bike paths ever. You can travel off road all the way from Mount Vernon, Va. (President George Washington’s home), through Old Town Alexandria, past Reagan airport (stopping to sit for a bit and watch the planes land right over your head at the end of the runway) on through Georgetown (stopping for a margarita at Washington Harbor) and on as far as you want all the way to Harper’s Ferry and beyond, along the C&O Towpath. visiting the monuments at night.